Been waiting for this page and it did not disappoint. Love how “H” OWNS it!!!! I can see the confidence in the last frame as his blushing in previous frame wears off….Love Helvetica!!!! It’s amazing how much expression and emotion each character has even though they have such simple faces. Fantastic work. I’m looking forward to reading through the archive my next opportunity. 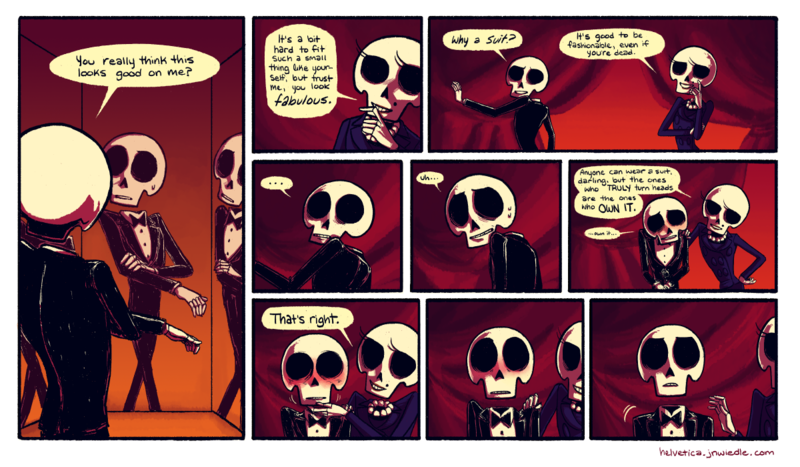 This comic is wonderful! What is this made with? So far I am guessing it is a mixture of traditional and then Photoshop. Your use of color is wonderful! Ahh thank you!! I actually do this comic entirely in Photoshop, aside from thumbnailing the panels in pencil. Is it just me, or did it seem like Madame H. was macking on Helvie? ?